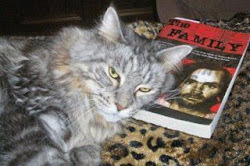 The Tate-LaBianca Homicide Research Blog: Manson not cremated yet, refrigerated in Kern County. Manson not cremated yet, refrigerated in Kern County. I think most states give precedence to a "blood" relative in a case like this. I think dna tests have proven Jason Freeman is the grandson of Charles Manson, most states would probably give him custody of the remains. I don't know about the legal standing of the hand written wills. Of course that's California so a court will probably rule the remains belong to Kasey Kasem's ex wife, and appeals will last for decades while the tax payers foot the bill for keeping the remains in cold storage.